The transformation of the aims of Brexit emerged during the early days of the referendum campaign, when the cross-party campaign for leave realised where the route to broad-based success lay. April 18, 2018. 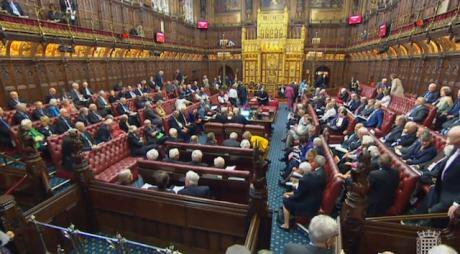 Peers in the House of Lords, London, as the Government suffers its first defeat over the EU (Withdrawal) Bill when peers voted in favour of a customs union amendment.PA/Press Association. All rights reserved.In January 2013, Prime Minister David Cameron made a long-awaited speech at the Bloomberg offices on the UK’s future in the European Union. Cameron’s pitch that day was clear: the EU needed to adapt to the modern age; it needed to become more competitive and less bureaucratic; and it needed to embrace global trade. As he argued for an in-out referendum, setting in train the series of events leading to the UK’s impending withdrawal, he claimed that Euroscepticism was rooted in a feeling that the EU had turned out very differently to the institution the UK public had originally voted for in 1975. The EU had become increasingly bloated, inefficient, and meddlesome – the public wanted a return to a “common market” free of unnecessary rules and regulations. The single market, he exhorted, was incomplete; more had to be done to break down barriers in services, energy, and digital. At the same time, he railed against “complex rules restricting our labour markets” and “excessive regulation” holding businesses back and called for small firms to be exempted from more EU directives. He didn’t once mention immigration. Five years later, Prime Minister Theresa May gave a rather different speech in London as the UK prepared for EU withdrawal. Rather than expounding the single market’s advantages, she argued that the UK would have to leave it, because to do otherwise would mean continued free movement. Rather than calling for deeper links in services, she acknowledged that trade post-Brexit would be less free. And rather than embracing deregulation, she said that UK and EU regulatory standards would remain “substantially similar” in future. This lays bare the bizarre reversal of the political economy of Brexit. A movement that began in essence as a means of casting off EU regulations while retaining economic links has morphed into a government agenda resolved to cutting trade ties while keeping – even strengthening – those very regulations that Eurosceptics once so derided. The reasons for this about-turn are complex. On one level, the Eurosceptics’ original plan for delivering Brexit was never a plausible one: it is not possible to retain the advantages of the “common market” while at the same time jettisoning the rules and regulations that bind it together. For the other member states, the EU’s employment, environmental and consumer legislation are not superfluous appendages to the single market but core pillars that allow member states to compete on a level playing field. This perspective could therefore never have survived collision with the reality of the Brexit negotiations. But more fundamentally than this, the transformation of the aims and principles of Brexit emerged during the early days of the referendum campaign itself. Before 2015, Eurosceptics regularly referred to the Working Time Directive – or more broadly to social and employment legislation – in their fulminations on the perils of EU bureaucracy. But as the cross-party campaign for leave was formed in the run-up to the referendum, it realised that the route to success lay in a broad-based message that dutifully avoided many leavers’ libertarian instincts, and that sought to allay concerns of post-Brexit disaster. Claims that EU withdrawal would enable the UK to strip away worker and consumer rights were now confidently dismissed as another hyperbolic strategy of “Project Fear”. The root cause of this shift was simply that there was – and indeed still is – no public appetite for a deregulatory agenda. The root cause of this shift was simply that there was – and indeed still is – no public appetite for a deregulatory agenda. Our own polling with Opinium has found widespread public support for some of the most controversial EU-derived employment, environmental and financial legislation. The Working Time Directive – the prime example Cameron gave in his Bloomberg speech of interfering EU legislation – is either supported or considered insufficient by 73 per cent of the public. Renewable energy targets – another bugbear of earlier Eurosceptics – are endorsed or considered too low by 74 per cent. And the bankers’ bonuses cap – opposed at the time of its introduction by the coalition government – is found either adequate or too generous by 79 per cent, with a majority backing tighter rules. Even when traded off against a US trade deal, more than 80 per cent of the public are opposed to lowering food safety standards. When confronted with this wall of public opinion, it is no surprise that leave campaigners adapted their position as the referendum date neared. In the aftermath of the referendum, the narrative of protecting EU regulatory standards gathered increased force with Theresa May’s arrival in Downing Street. Under Cameron, the drive for deregulation was not confined to the EU debate: the coalition introduced a range of domestic initiatives aimed at reducing regulations for businesses, from the ‘Red Tape Challenge’, targeted at identifying 3000 regulations to be amended or scrapped, to the ‘one in, two out’ rule, which ensured that, for any new regulation, departments would have to make savings equivalent to double the cost of the new rule by removing or modifying previous regulations. Under May – and particularly in light of the Grenfell Tower tragedy – the cutting red tape agenda was quietly shelved in favour of embracing an openly interventionist role for the state. But under May – and particularly in light of the Grenfell Tower tragedy – the cutting red tape agenda was quietly shelved in favour of embracing an openly interventionist role for the state. Indeed, May’s approach in part came out of the EU referendum vote: she (rightly) interpreted the result as a call for a larger, more protective state, rather than a smaller, more liberal one. In this context, the government’s commitment to maintaining employment, consumer and environmental standards post-Brexit is a natural extension of its domestic programme. What this ideological transformation means for the forthcoming negotiations on the UK-EU future partnership is unclear. The debate until now has been between those who want a model of close alignment with the EU post-Brexit and those who want the maximum flexibility to diverge once we leave. But the political fluctuations over the past five years have rendered the question of divergence devoid of any substantive meaning. If divergence is about deregulation, then this flies in the face of public opinion and, indeed, much of the current Cabinet. It would be interpreted by many as a betrayal of those leave voters who were in large part fundamentally opposed to a shrinking of the state and unaware that their vote could be interpreted as such. But if divergence is about strengthening regulations and expanding the role of the state, then it is largely pointless, since in most cases the EU sets minimum standards for harmonisation and does not restrict, for instance, stronger working time rules (see France) or tighter caps on bankers’ bonuses (see the Netherlands). Even EU state aid rules are largely compatible with an active industrial policy and the nationalisation of strategic industries. Even EU state aid rules are largely compatible with an active industrial policy and the nationalisation of strategic industries. Divergence therefore comes down to a matter of ‘doing things differently’ in some unspecified way. Yet such a move would almost certainly face widespread opposition from business – who, all things being equal, find it easier to work with similar cross-border regulations rather than different ones. Shorn of a ‘cutting red tape’ agenda, divergence would therefore do little other than frustrate the very people it was originally designed to help. As a result, the shift in the underlying ideology of Brexit strengthens the case for a high-alignment relationship between the UK and the EU. Indeed, the European Council guidelines require a ‘level playing field’ – including aligned rules on tax, state aid, and social, environmental and regulatory measures – even for a limited UK-EU FTA. This means that even a future partnership that prioritises divergence would still require considerable alignment in practice – hence the UK’s concerns about a deal that offers “the rights of Canada and the obligations of Norway”. On the other hand, a high-alignment model – along the lines of IPPR’s ‘Shared Market’ proposal – would ensure closely aligned regulations alongside a concomitant level of access. An agreement of this type would help to guarantee the high level of access we need while acknowledging UK and EU regulations will remain closely aligned in future. Given the weak political case for divergence, and given the EU’s geographical proximity and importance as a trading partner, the alternative would simply be unilateral alignment without a corresponding right of market access. As David Cameron said in his Bloomberg speech, “if we leave the EU, we cannot of course leave Europe. It will remain for many years our biggest market, and forever our geographical neighbourhood.” This part of the speech, at least, has stood the test of time.